One of the greatest defensive performances in NFL history happened in 1971. The defending Super Bowl champion Colts had the #1 defense and drug a struggling offense to the AFC Championship Game. They allowed the 2nd fewest yards per game mark in the NFL since 1970 with 203.7 yards. With only 140 points allowed, it would have been an NFL record had the ’69 Vikings not broken their old scoring record of 144 with 133. Bubba smith coming off the ball. One interesting aspect of the ’71 Colts was how anemic their once great passing offense had become. The 38 year old Unitas completed just 52.3% of his passes for 3 TDs and 9 interceptions. Earl Morrall, who was 37, fared no better with an even lower 50.3% with 7 TDs to 12 ints. They were 21st in passing offense and 12th overall making the defense work harder. During the ’71 season the defense held 7 of their 14 opponents to 10 points or less. Including 5 of their first 6. Baltimore’s D recorded 3 shutouts and held their first playoff opponent to 3 points. In facing 5 top ten offenses that year, they were 4-1 and held two of those to 10 points or less. Yet why aren’t they remembered?? Right now fans of the Doomsday Defense, The No Name Defense, and the Steel Curtain are saying to themselves ‘Its not all about stats”. Which is true until you realize this was a defending Super Bowl champion that made it back to the AFC Championship Game despite its offense. 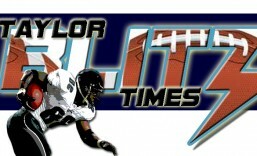 Had they won against Miami, they would have taken on the Dallas Cowboys in Super Bowl VI. Well that is who they beat in Super Bowl V to become champions in the first place. Mike Curtis tackling Cliff Branch. Led by Pro Bowlers DE Bubba Smith, MLB Mike Curtis, LB Ted Hendricks, SS Jerry Logan, and FS Rick Volk, its amazing only Hendricks is in the Hall of Fame. Curtis definitely should be but when you think of Hendricks making the Hall that is primarily from his work with the Raiders. This was the last hurrah for the Colts as everything came apart starting in 1972. That was the year owner Carroll Rosenbloom swapped franchises with Robert Irsay. Head Coach Don McCafferty fired, John Unitas sent to the bench and the run as an NFL elite team ended. Yet a tremendous performance by the defense in 1971 allowed them to hang on for one more season. When you think of the old Baltimore Colts, the first flashback that comes to mind are the black and white films with Johnny Unitas leading the team in the 1950’s. Then another thought stirs up images of Bert Jones, Lydell Mitchell and the mid 1970’s version with Head Coach Ted Marchibroda. You follow-up that thought with the green and yellow Mayflower trucks moving the team to Indianapolis in the middle of the night in 1984. Yet sandwiched between the first and second of these events is the most forgotten champion in modern football history. The 1970 Baltimore Colts. The bauble won for becoming the first champion of the post AFL/NFL merger. There are varied reasons why this team is so overlooked when you think of this franchise. 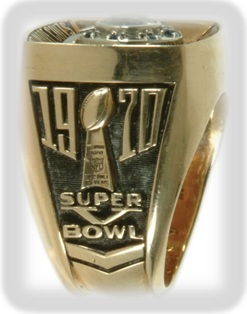 Did you know this is the only Super Bowl winner where the franchise was sold just one year later?? Before the 1972 season, Robert Irsay (Los Angeles Rams) and Carroll Rosenbloom swapped franchises. Carroll had one of the most successful tenures as an owner in NFL history. Yet after losing Super Bowl III, one of the landmark games in league history, he lost Head Coach Don Shula to the Miami Dolphins after the 1969 season. 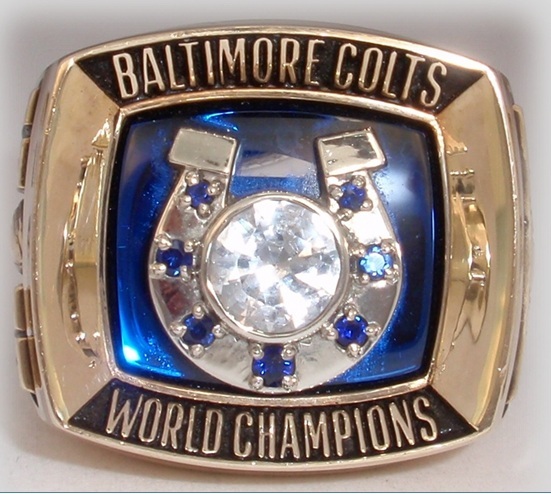 The last ring won by John Constantine Unitas and Carroll Rosenbloom. So is it ironic or part of the story that his last game as Colts owner, was a 21-0 loss to Shula’s Miami Dolphins in the 1971 AFC Championship Game?? Another twist was it was played in the Orange Bowl which had been the site of Super Bowl III. Another reason this champion wasn’t remembered is there wasn’t a main powerful character. Yes the Colts had an aging fading John Unitas at quarterback. In 1970, he finished with a career low 51.7% completion percentage, and was the only qb to win the Super Bowl in a year he threw more interceptions (18-14) than touchdowns. He was 3 seasons removed from 11 straight Pro Bowl seasons and 5 player of the year awards. By this time he was getting by on inspiration and finding the touch at the right time. As was the case in the first ever AFC Championship Game. Clinging to a 20-17 lead late in the 4th,Unitas had reserve WR Ray Perkins motion from the backfield and lofted a perfect sideline floater just past Raider CB Nemiah Wilson for the decisive touchdown. It was the only touchdown he threw in the game as he went 11 of 30 for 245 yards. Super Bowl V was the first NFL championship game not played on natural grass. It was echoed in Super Bowl V as he went 3 for 9 for 88 yards with 2 interceptions and 1 TD before being knocked out of the game. The lone touchdown was the bizarre 75 yarder to John Mackey where the ball bounced from Colt Eddie Hinton and Cowboy Mel Renfro first. So the late Earl Morrall had to come off the bench to save the Colts season just as Unitas tried to in Super Bowl III. The game was played at a frantic pace with 11 total turnovers in what was nicknamed The Blunder Bowl. The Colts outlasted the Dallas Cowboys, they didn’t beat them. A last second interception by Mike Curtis put them in position for Jim O’Brien to win it with a field goal 16-13. Another reason they weren’t remembered were they were coached by the late Don McCafferty. He was the hand picked successor once Don Shula departed for Miami having been the long time Offensive Coordinator. By the time we make it to 1972 the Colts were winless in their first five games. General Manager Joe Thomas wanted Unitas benched. When McCafferty refused he was fired. Less than 1 1/2 years after winning Super Bowl V, Carroll Rosenblom was no longer the owner, John Unitas was no longer the quarterback, Don McCafferty was no longer the coach, and the magic was gone from 33rd Street in Baltimore. The romantic era starting with the 1958 NFL Championship Game win over the Giants, ended with the 1971 AFC Championship loss in Miami. In many ways the Super Bowl V championship had a lifetime achievement feel more than a best of the league feel. Would they have won Super Bowl VI had they rematched with the Cowboys?? How different would have Don McCafferty’s legacy been had they won it? As a matter of fact, the Dolphins split their games with the Colts in 1970 and 1971. Would the Colts even make it to Super Bowl V had the Dolphins been able to get past Oakland in the ’70 playoff game?? Epilogue: Carroll Rosenbloom’s Rams won the NFC West 5 times from 1973-1978 but lost the NFC Championship 4 times. He died from a heart attack and drowned before the 1979 season when the Rams did make it to Super Bowl XIV. Which left the team to his wife…. Georgia Rosenbloom who later remarried. Georgia Rosenbloom-Frontiere. Don McCafferty died of a heart attack in 1974 after he had coached the Detroit Lions for one season. 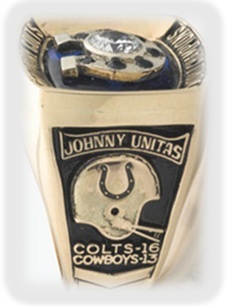 John Unitas remains one of the greatest players in NFL history and was the first to throw for more than 40,000 yards. A staple at Baltimore Ravens games well into the 2000s. Unitas passed away on Sept 11th, 2002. Earl Morrrall, the journeyman quarterback who was player of the year in 1968 with Unitas out. Was with the team when they lost Super Bowl III. Afterward he would duplicate his 1968 with a great performance leading the Dolphins to the undefeated season in Bob Griese’s absence. He won 2 more Super Bowls (VII & VIII) with Don Shula’s Miami Dolphins. Morrall died last month on April 25, 2014. To these men I dedicate this article to… they were a champion. NFL champions for 1970.